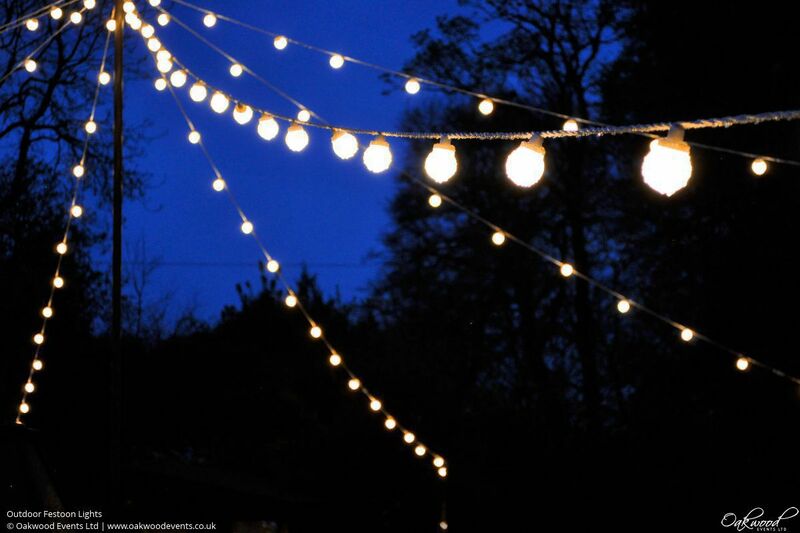 Make the most of the outdoor spaces around your venue by lighting up patios, trees and walkways with waterproof uplighters, flood lights, festoons and fairy lights. Both attractive and functional, outdoor lighting can be as simple as uplighting a wall or entrance area or be more creative by highlighting features such as trees, arches and pergolas with fairy lights or in a range of colours for an impressive visual impact. 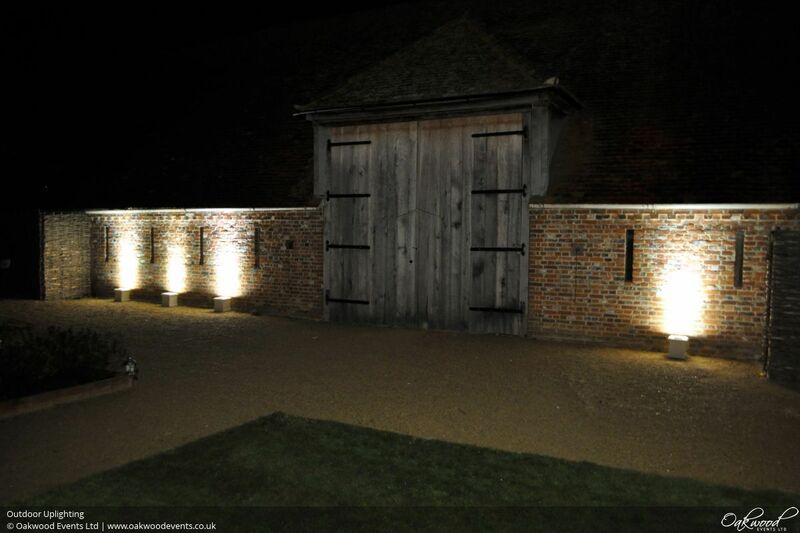 We work with the unique features of each venue to design outdoor lighting schemes using fairy lights, festoons, outdoor uplighters and flood lighting. A simple yet incredibly flexible way of adding light outdoors, waterproof wireless uplighters are used to shine light up from floor level onto walls, doors or other surfaces. The light creates a dramatic look by highlighting selected venue features and reflects back into the surrounding space, giving a soft light around a patio or entrance area. Being wireless means the lights can be positioned for the best effect without the worry of trailing cables crossing paths and doorways. The units are controlled by a timer so that they will switch on automatically at the appropriate time during your event and then switch back off again after your guests have left at the end of the evening. The lights can be set to white or a colour of choice. For outdoor areas we recommend bright, bold colours as they tend to give the best effect. Consideration also needs to be given to the colour of the surface they'll be shining onto. Many venues have external features that can be decorated with fairy lights such as trees, arches, walkways, railings, etc. 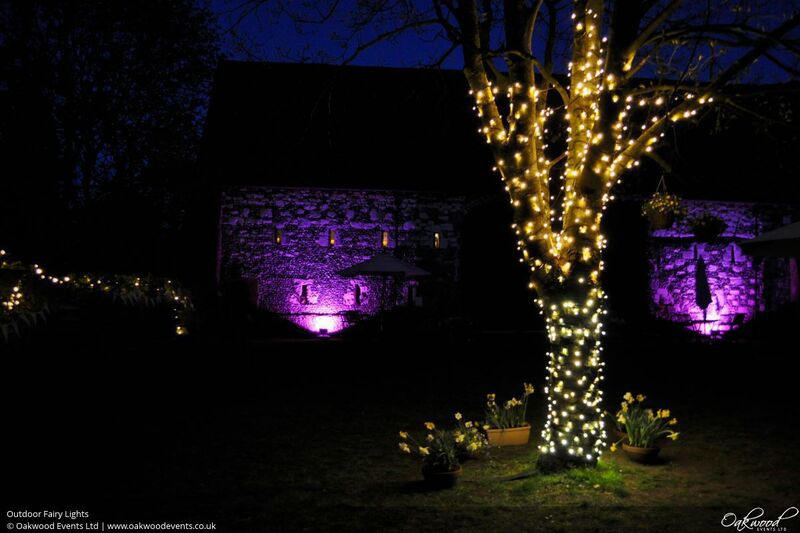 Our high quality waterproof fairy lights provide much more light than typical Christmas type lights and so can be used to provide useful lighting to an area as well as looking pretty. Some of the most common ways to use fairy lights outside are to wind the light onto trees, swag along railings or swag lights across a covered walkway or pergola. 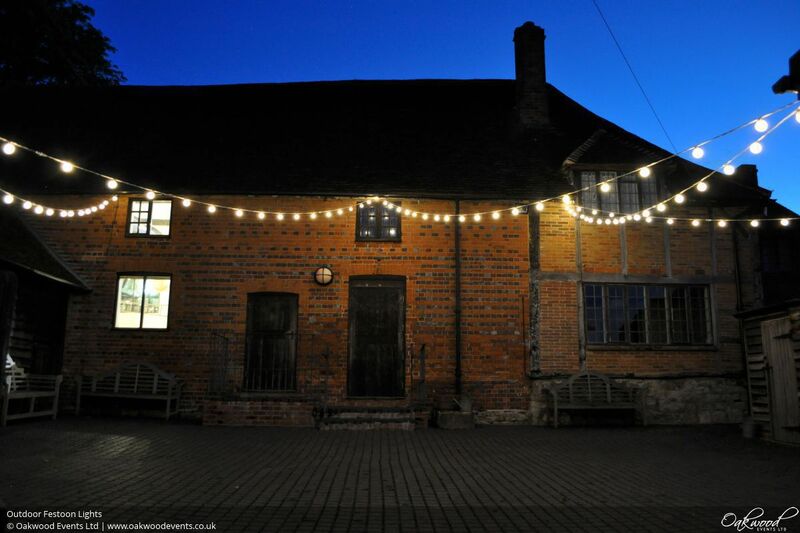 Festoons are a series of bulbs on a cable which can be attached to or suspended between features such as buildings and trees. They give a diffused, warm white light which is perfect for lighting larger areas such as around the edges of a courtyard or patio or along the side of a path. 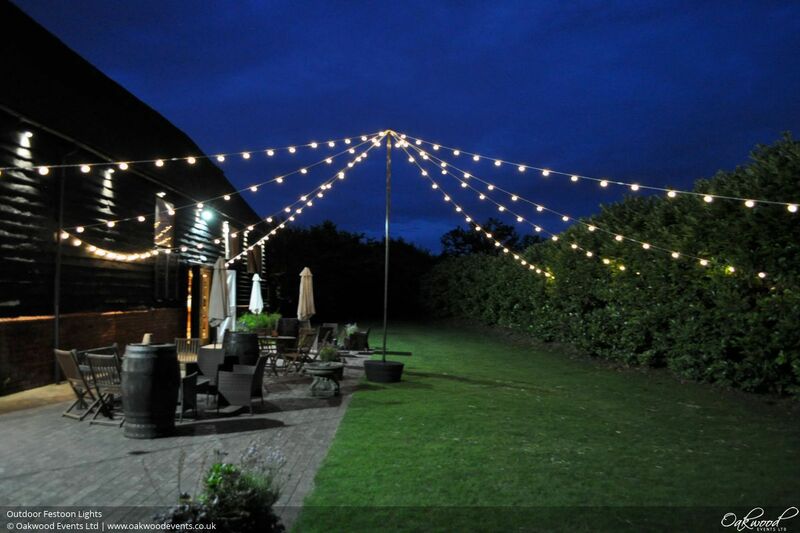 If no suitable buildings or trees are available, festoons can still be used by attaching them to freestanding poles or on our custom built festoon star canopy which suspends several sets of lights overhead, radiating out from a high central point to lower points around the edge in a star pattern. Similar to outdoor uplighting but with a wider coverage, flood lights are used to fill a larger area such as the side of a building, trees, statues and bushes. Flood lights can be white or coloured and they can be used either as functional / safety lighting or creatively as an effect similar to uplighting on a larger scale. Shown here are a set of flood lights lighting up a large portico in a warm gold colour on the inside with pink accents on the pillars at the front. The portico was used as a reception area and formed a stunning backdrop to some of the wedding photos. 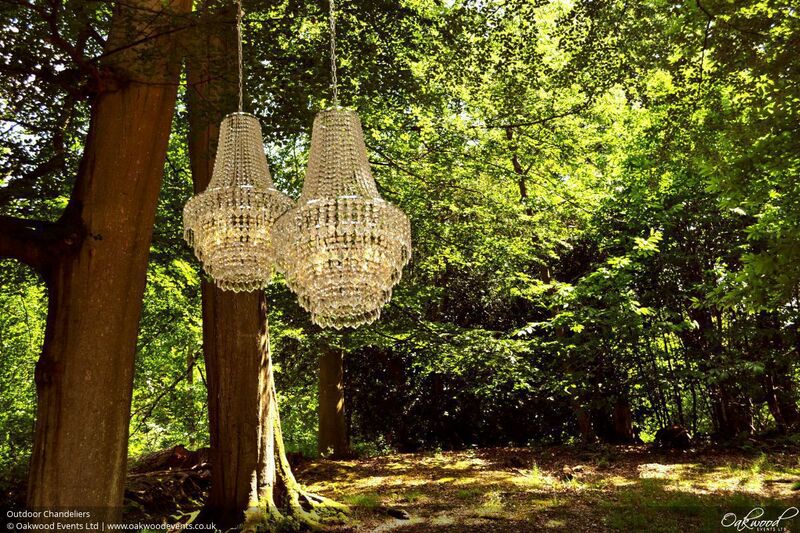 For something really unique we have some outdoor, waterproof crystal chandeliers that can be hung from the branch of a large tree. 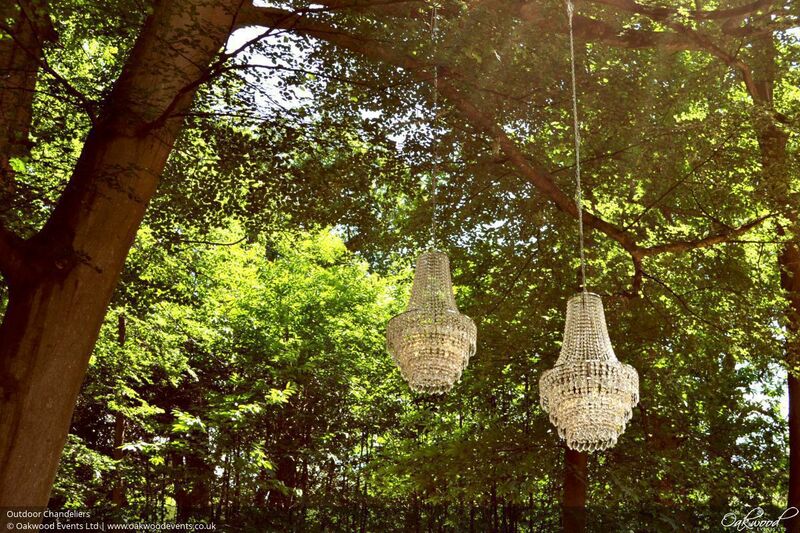 The chandeliers are lit from inside just as they would be indoors, with all of the components fully waterproofed making them safe to use outdoors even in the rain. 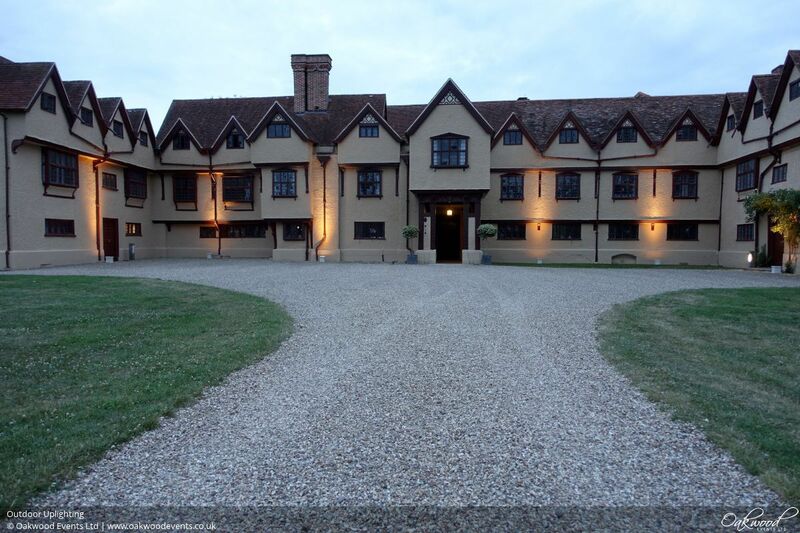 We have years of experience both designing effective outdoor lighting installations and ensuring that they are safe and reliable on the day. We respect the venues where we work and use only temporary, non-damaging fixings. We take safety seriously and can supply evidence of our public liability insurance (PLI) and portable applicance testing (PAT). We undertake working at height and electrical safety training and all of our ladders, scaffold towers and specialist equipment is regularly maintained and checked. We pride ourselves on our smart, efficient and polite approach to installs and pack downs. 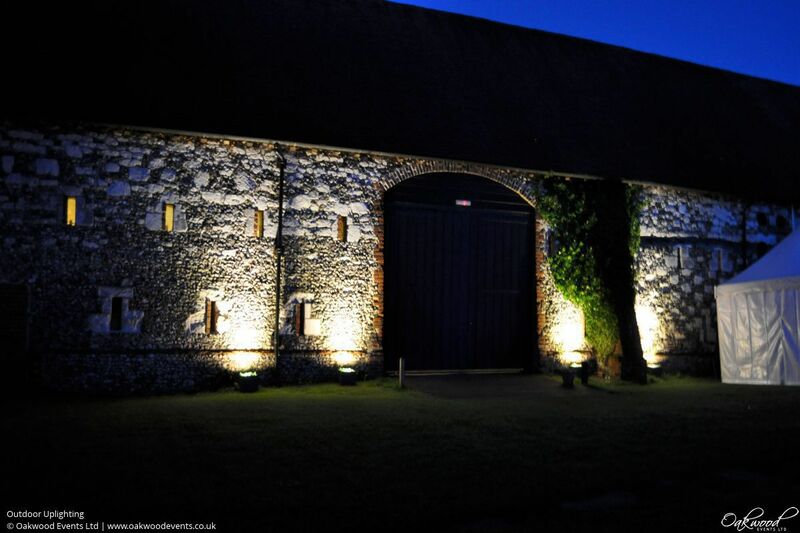 Our eye for detail, technical excellence and designs that maximise the venue features are borne from our extensive experience specialising in barn lighting. For more examples of our outdoor lighting designs, see our dedicated Pinterest board. 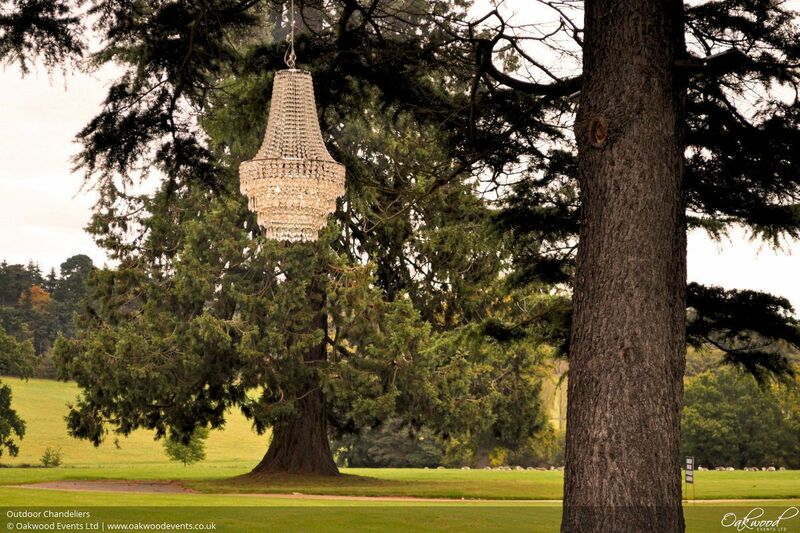 To discuss lighting options for your event feel free to contact us here.